The All-Star Game voting has picked up serious pace, with a double voting day gone and 3 more remaining. Giannis Antetokounmpo and Kyrie Irving are, respectively, the frontcourt and backcourt leaders in votes polled for the Game this year thus fa (both of them have tallied over 1 million votes already and look primed to break the 2 million vote barrier with easy-to-access voting systems). Who are the rock-solid selections certain to start the game? Which up-and-comers are on their way to a first All-Star game selection? Which veterans will make it once again? Will team record matter at the end of the day? The afro look, the deferential approach to offense and the seemingly unconditioned start that Kyrie had for the first 6 games of the season were enough for a lot of basketball fans to bring the pitchforks out for the Celtics guard. Ever since game 7 of the season, however, Kyrie has been on a real tear, raising his scoring average from 16.4 points per game in October to 25+ in the months of November and December while improving his stats and percentages across the board. The Celtics are 4-0 in overtime primarily because their crunch-time offense devolves into getting Kyrie the ball and praying for him to make the shot, and Irving is just that good that this tactic works seamlessly against the vast majority of teams. He's the third best point guard in the game today, at the very least, and he's playing like it this season. 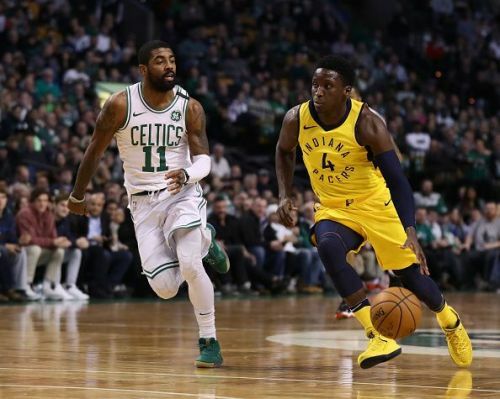 Oladipo and the Pacers are the epitome of a really successful and yet unnoticed franchise in the 2018-19 NBA season. The Pacers have reduced their reliance on their combo guard significantly through the course of games, but they always entrust the ball to their All-NBA selection during crunch time, and with ample good reason. Outside of Kyrie, Oladipo has the best clutch time scoring stats for any guard in the league this season. His averages are down since the past 10 games or so as he eases back from a knee injury that he suffered in early November, but there's no doubt in any opponent or teammate's mind about Oladipo's status as the premier two-way shooting guard in the NBA.